Buellia griseovirens (Turner & Borrer ex Sm.) Almb. 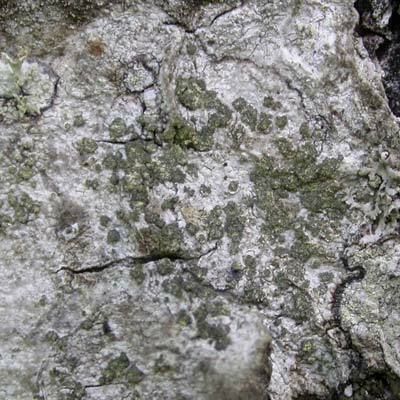 This crustose species is mostly characteristic of old wooden fencing and twigs and branches of acid-barked trees. 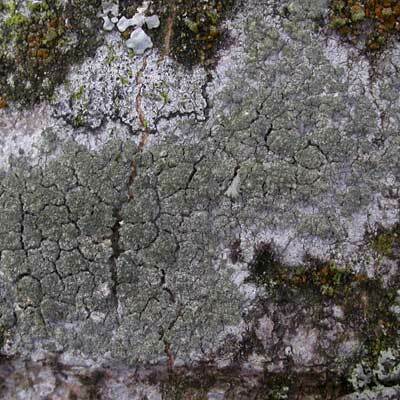 The thallus is usually sterile (without discs), grey, and is covered with ulcer-like dark green to blue-green soralia. Owing to the nature of the climate, the interior of Ireland has its field boundaries rarely fashioned from wood so weather-worn worked timber is in short supply. Picnic tables are today one of the best alternative habitats for it. B. griseovirens turns K+yellow to red. It is a much overlooked species. It is most likely to be confused with Trapeliopsis flexuosa which is C+ red. Simms, M. J., (2016). Buellia griseovirens (Turner & Borrer ex Sm.) Almb.. [In] LichenIreland.